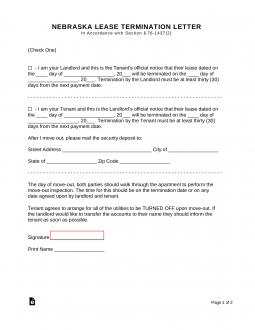 The Nebraska Lease Termination Letter Form (30 days notice) is a document that is generally required by landlord or tenant, for the specific purpose of providing notice one party to the other, 30 days in advance. This document, if properly completed with notice to vacate and delivered or served in a timely fashion, shall keep the serving party, in compliance with state law and the lease signed between the parties. The parties must schedule a move out inspection, as agreed upon between the parties.